Kadhi is a popular Indian recipe. Combination of Kadhi and rice is highly on demand. When I was child, our family ate pulse and vegetables almost every day, sometimes for a change in the food menu, my mother cooked Kadhi and rice. Read More: How to made Hot-Hot Bread pakoda ? Firstly we should prepare gram flour batter by adding water. This batter should be thick. Whisk this better with spoon continuously for 5 min. and then divided in to 2 parts; one for pakoda and other one for Kadhi. Read More: How to make Momos? How to pakoda for Kadhi? Again whisk the gram flour batter. Pour it in round shape. Make 5-6 pakoda at one time. Turn and flip the pakoda. Both sides should be attaining golden brown. Take them out from pan. With repeating the same process, make at least 20 pakoda (per person 5). You pakoda are ready for Kadhi. Take the other part of gram flour. Add this curd in gram flour batter. Mix it properly. Add 1 cup water in this mixture. Make a thin batter. On the other side, heat 1 tbl spoon in pan on medium flame. Tamper the cumin seed, Asafoetida and green chili. Pour curd-gram flour batter in pan. Mix it continuously till it gets thick and make start to boil. At last, add salt as per your taste. Let it cook on Keep medium heat. Cook it for 12-14 min. But don’t forget to stir it on every 2-4 min. 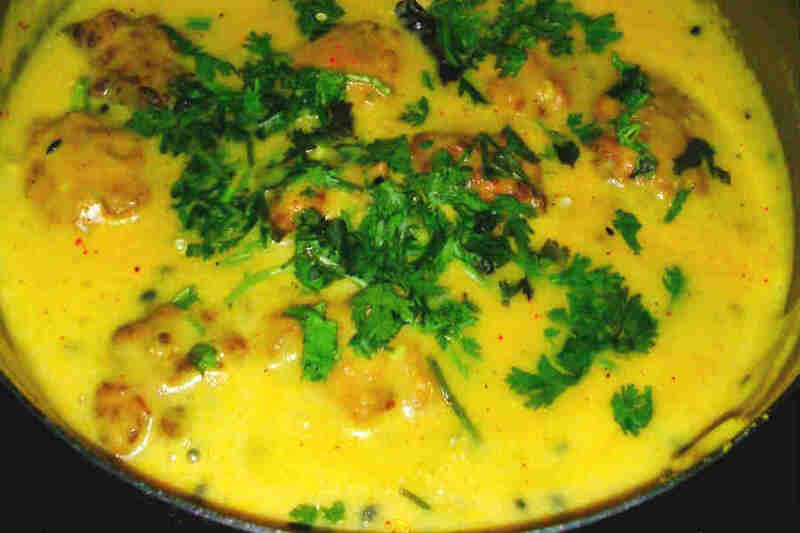 After a while, gram flour cream will be appears on side of the pan, it shows your Kadhi is ready for garnishing. Take it out in serving bowl and garnish it with fresh green coriander leaf. You can eat it with rice, chapati or naan. For extra taste, you can add one spoon of desi ghee in it. Njoy!! !